Property Details: 2 Bedroom, 1.5 Bathroom Vacation Rental, sleeps up to 6. Gulf View condo, beach resort home in Gulf Shores. This 2 bedroom/1.5 bath unit has everything you need for a quick weekend getaway or a week stay on the Gulf Coast. The living room offers a sofa, love-seat, and entertainment center with television and DVD. Adjoined to the living room are the dining area (with table and chairs for 4 and bar with seating for 2) and half bath. The kitchen is stocked with everything needed for cooking or grilling. Both bedrooms are located upstairs and offer queen beds with twin bunk beds in each (perfect for 2 families of 4). The full bath is located between the two bedrooms. Bedding, towels, hand towels, and washcloths are provided. Gulf View is directly across from the Gulf of Mexico. There are balconies located off the living room and one of the bedrooms; which offer a limited gulf view. 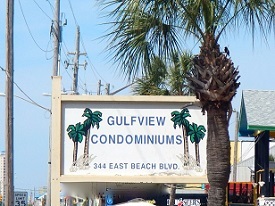 Gulf View Condo Rental in Gulf Shores AL.